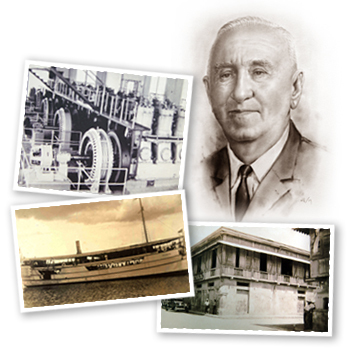 Aboitiz & Company (ACO) was founded by Paulino Aboitiz in the late 1800s as an abaca trading and general merchandise business in Ormoc, Leyte and later ventured into inter-island shipping to transport its goods across the Visayas. It was formally incorporated in 1920 and serves as the private holding company of the Aboitiz family today. When Don Ramon Aboitiz, Paulino’s second son, took over management of the company, he established a strong foundation of growth and expansion. From a small mercantile operation, ACO has grown and diversified to various companies engaged in distinct services in key industries that are contributing to nation-building. The journey of ACO from a small family business to being one of the largest and most respected business groups in the Philippines is a testament to its solid foundation built on trust, fairness, integrity, and quality. With five generations of family and professional management behind its business success, Aboitiz echoes the time-honored philosophy of Don Ramon, the legacy of excellence nurtured and strengthened over the past century. Aboitiz Construction, Inc. is one of the most reliable and respected industrial contractors in the Philippines. It is one of the few Philippine contractors with a very wide range of experience in major engineering & construction projects. We are capable of doing work from conceptualization to execution and commissioning, from earthmoving to marine structures, from petrochemical to world-class resorts, from warehouses to office buildings, and more. It has a regular workforce of over 500 engineers, technicians and administrative professionals supported by a ready pool of over 5,000 skilled personnel. Workforce is continuously built through partnership with the Technical Education and Skills Development Authority (TESDA), schools, and skills training centers, as well as various barangays through mobile skills trainings. This partnership has become our ultimate and immediate source of skilled manpower for various projects nationwide. Aboitiz Construction, Inc. has distinguished itself as a responsive and flexible organization with the capacity to handle markets requiring a specialized and broad technological base. Aboitiz Construction, Inc. is a registered triple “AAA” General Contractor with the Philippine Contractors Accreditation Board. AEV is recognized as one of the best-managed companies in the Philippines and in the region today. It is consistently cited for its commitment to good corporate governance and corporate social responsibility. With five generations of Aboitiz Group business success behind it, AEV is moving forward, pursuing its vision to be a truly sustainable enterprise that can be entrusted to future generations. Aboitiz InfraCapital, Inc. (AIC) is the fifth business leg that undertakes all infrastructure and infrastructure-related investments of the Aboitiz Group. AIC is poised to take advantage of the growth momentum and the government’s commitment to bolster further advancement, by building the right infrastructure that will advance business and communities. The Republic Cement Group<, AEV’s partnership with CRH plc, is the country’s second-largest local cement manufacturing and distribution company. It operates six cement facilities across Luzon, Visayas, and Mindanao producing over 25% of the cement requirements of the country. APO Agua Infrastructura, Inc. is a joint venture between AEV and J.V. Angeles Construction Corporation. APO Agua signed an agreement with the Davao City Water District (DCWD) to build one of the country’s largest private bulk water supply project with a capacity of at least 300 million liters per day of potable water sourced from the Tamugan to benefit Davao City’s one million residents. Aboitiz Land, Inc. ​is engaged in the design and development of distinct communities for residential, industrial, and commercial use. After over two decades in operation, it is today one of the country’s most trusted companies in real estate development. It continues to strengthen its position by expanding geographically through land banking in key growth areas across the country while continuously delivering dream homes and commercial spaces. In 2014, Cebu’s homegrown real estate developer kicked-off its national operation by acquiring LiMA Land, developer of the 590-hectare LiMA Technological Center in Batangas. Today, the Land Group is geared towards growth in all of its business units, aiming to become a stronger player in the national real estate scene by curating communities that ensure better lives. Aboitiz Power Corporation, a vertically integrated company engaged in power generation, distribution, and energy supply, is one of the largest private power producers in the Philippines. The Generation Group harnesses power from a right-mix portfolio of renewable (hydro, geothermal and solar) and non-renewable (coal and oil) sources through its 46 generation facilities across the country. The company’s hydro group is the pioneering industry leader in the development of small to medium hydroelectric plants over the past 39 years. With over 70 years of experience in the power distribution sector, AboitizPower’s Distribution Group is currently composed of 8 utilities, including the nation’s second and third-largest, which supply electricity to high-growth areas in Central Luzon, Visayas, and Mindanao. The Group continues to implement innovative and efficient ways to serve the growing needs of over 917,000 customers. Pilmico Foods Corporation, established in 1962, is among the top 3 flour milling companies in the Philippines. A leader in operating efficiency, it manufactures flour and wheat by-products. Pilmico has also been a strong player in animal feeds and swine production since establishing these businesses in the late 1990s. With its commitment to quality products and processes, the company ensures its market competitiveness by increasing customer satisfaction while remaining a low-cost producer. In 2014, the Pilmico Group acquired Vinh Hoan Feeds, an aqua feeds plant in Vietnam, marking the group’s entry into the international market. Pilmico is currently building capacities and capabilities to sustain profitability and grow its businesses both in the Philippines and in the ASEAN region. (UnionBank) is a publicly listed universal bank that distinguishes itself through superior technology, unique branch sales and service culture, and centralized backroom operations. It is consistently recognized as one of Asia’s leading companies in banking and finance, ranking among the country’s top 10 universal banks in terms of key performance ratios in profitability, liquidity, solvency, and efficiency.